What's not to love about this classic Louisiana sandwich? Po'Boys are typically made with fried shrimp or catfish and are served everywhere in Louisiana. There is nothing better than a soft, yet crusty roll with crispy fried flounder. Fully dressed with roasted red pepper and garlic aioli, shredded lettuce, tomatoes and dill pickles. 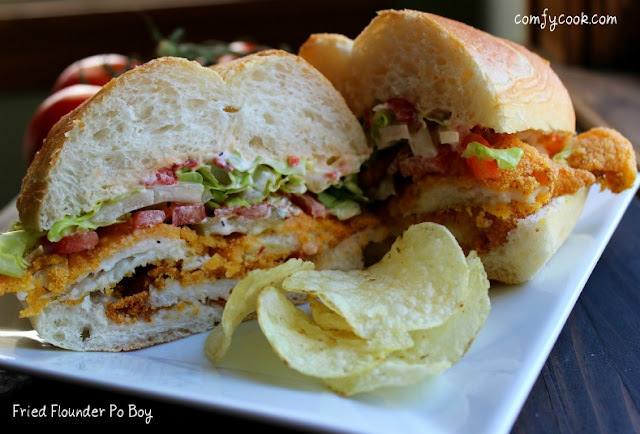 This Po' Boy is not going to be here for long! Combine ingredients for Roasted Red Pepper Aioli and chill while preparing fish. Combine cornmeal, flour, cayenne pepper, garlic powder, onion powder, salt and pepper in a shallow plate. Beat together egg and 1/2 cup milk. Sprinkle fish filets lightly with salt and pepper. Dip into egg/milk mixture and dredge in cornmeal coating. In a skillet, heat about 1-inch of canola oil over medium-high heat until shimmering. Add fish fillets and fry until golden brown, about 3-4 minutes. Turn carefully and brown other side. Drain on paper towel. Slice rolls and build your Po' Boy.